If you were among the unfortunates who downloaded iOS 8.0.1 only to discover it came with an unexpected bonus - fixing a bug that previously allowed you to make calls - then we're pleased to tell you the next update has arrived. iOS 8.0.1 broke network functionlity and TouchID for thousands of users who downloaded the software. 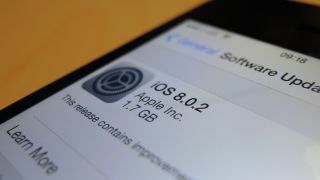 Apple says the new update patches those problems, along with others that iOS 8.0.1 was supposed to address: non-working Healthbook apps, misbehvaing third-party keyboards, apps being blocked from accessing your Photo Library, and more. Users who have already downloaded the update are reporting no signs of any major glitches - so far, so good. iOS 8.0.2 can be downloaded on all iOS 8-compatible devices. Just pop into Settings>General>Software Update to find it. Nasty bugs aside, what do we love about iOS 8?